Web Crawling – Identifying web pages. Starts with links that it knows and follows links on pages to other web pages. Search Index – Gathers and lists words on each web page. This figure shows the basic operation of a search engine. 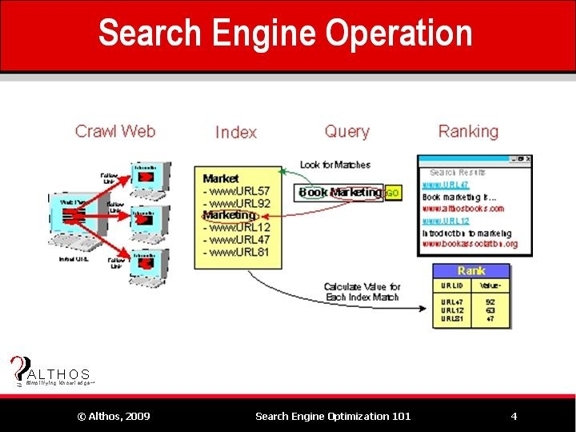 This example shows that the search engine starts by searching (crawling) through web sites to find existing and new web pages. The search engine analyzes and captures information on these web pages to update an index of the words that the web pages contain. The search engine then receives search requests with words and/or operational criteria (logical search). When search terms are submitted, they are processed and compared to the search index to create a new list of web pages that match the search criteria (the search result).